Are you one of the millions of skiers who hit the slopes hard opening week only to hobble around for the first few days afterward? Here's a full-body workout plan get your body in shape for the entire season. This is the first week out of your six-week training plan to help you become a stronger and injury-free skier. Wesley Arnett, Personal Trainer at Viking Power Fitness in Denver, has trained skiers, recreational and professional athletes for years. He says, "Often the large muscles can take the constant motion and pounding of the legs, but it is getting the secondary muscles trained and conditioned to help avoid injury." Quadriceps: "Quadriceps are probably the most used muscle group in skiing. 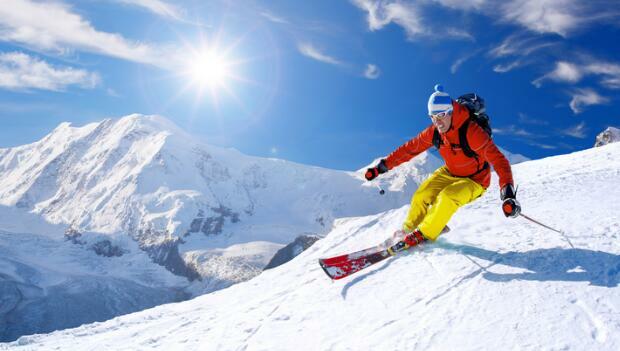 These muscles hold you in position as you ski and provide protection for your knees. Great exercises for the quadriceps include squats and lunges." Hamstrings and Glutes: "When skiing downhill, you typically hold your body in a flexed position, which is leaning forward from the hips. This requires great strength from your hamstrings and glutes as they help stabilize your body. Work your hamstrings and glutes with deadlifts, one leg dead lifts, step ups and hamstring rolls on a Swiss exercise ball." Inner and Outer thighs: "Your inner thighs work like crazy to keep your skis together. Your outer thighs keep your body stable and help you steer. Some great exercises are side lunges, inner and outer pushes on the abductor and adductor machines, Swiss exercise ball squeezes for the inner thigh or sliding side lunges using disks." Calves: "Because your knees are bent as you ski, your calves (specifically the soleus) help you stay upright so you don't fall over (your boots help too). You can work this muscle by doing seated or standing calve raises." Abs and Back: "As you're in a flexed, bent over position, your back has to work like a maniac to hold your body in that position. To protect your spine from injury, your core must be conditioned. Work these muscles with exercises like bicycle crunches, V-ups, medicine ball twists, pully system wood chops, back extensions, lat pulls and dumb bell rows." Arms: "Along with your back, arms help push off with your poles while stabilizing your shoulder joints. Be sure to work your biceps and triceps along with the rest of your body." "This is an array of different workouts to do for the ski preseason and it is a great six-day workout for your week that includes one day of rest," says Arnett. More: Quiz: Do You Know Your Muscles?